MOSCOW (Sputnik) — Russia's energy giant Gazprom and Saudi Aramco have signed a memorandum of understanding on cooperation in gas projects, including in production of liquefied natural gas (LNG), according to a Gazprom press release published on Friday. "The document reflects the intention of the parties to explore the prospects for cooperation along the entire value chain from exploration, production, transportation and storage of gas to LNG projects," the company said. According to the document, the signing took place on the sidelines of the official visit of Saudi King Salman to Russia dubbed a "landmark event." The two companies are considering joint projects in oil refining in both Russia and abroad, as well as trading, according to the Russian energy minister. Moreover, Russia and Saudi Arabia signed a program of bilateral cooperation in the energy sector, a Sputnik correspondent reported on Friday from the signing ceremony. "Energy is the key area for us, for the development of cooperation between our countries," Russian Energy Minister Alexander Novak said before the signing ceremony. During this week's visit to Russia, the Saudi King has already met with Russian President Vladimir Putin and Prime Minister Dmitry Medvedev. 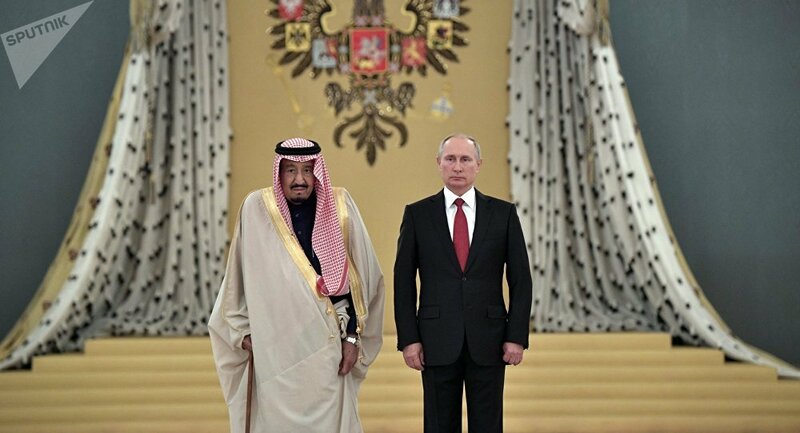 Saudi King Salman discussed bilateral cooperation, the situation in Syria as well as the Middle East, energy and other issues with Putin.